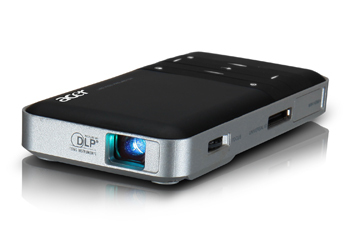 The Acer c20 Pico Projector is about the same size as a modern SmartPhone but slighter thicker. It has a built-in battery so you can, in theory, use it without mains power. It comes with a charger and several cables/adapters to connect to various devices such as your laptop. My initial idea was that it would be good to carry in place of a larger projector when doing small venue presentations, demonstrations or training. However I found that the connector to connect to a SmartPhone was an optional extra and when connected to a laptop the native resolution was less than the standard laptop screen so although the effective screen size was larger, the amount you could get on was less. I later found that better results were achievable if your laptop has an HDMI output in addition to the standard VGA output. However, in a normally lit office environment the image was also difficult to see clearly unless you beamed the image onto a screen close to the projector but this defeats the object and you may as well use a normal laptop screen or 19-21” TFT monitor. Connecting the Acer c20 to a Freeview Recorder using a HDMI cable and mini-to-standard HDMI convertor (not included but not expensive) and dimming the room light levels and the c20 appears to have found a possible use. Probably not in an office but in a living room or more realistically a bedroom as a replacement for a flat panel TV. With a flat, light coloured wall the images are clear and watchable without having to also acquire a projector screen. The HDMI feed from a HD device will give High Definition video quality up to 1080i. In my tests I mounted the projector onto a standard inexpensive camera tripod stand (<£10 from Lidl), fed a freeview HD signal from an AC-Ryan PVR and projected onto a flat wall 8ft away and achieved a watchable image with a diagonal image size of about 60”. The projector also comes with a built-in speaker and headphone/audio out socket. The advantage of this over a TV or conventional protector is that is uses very little power (<10w), runs silently and gives you a 60” image for the same price as some much smaller TVs but takes up virtually no room. On the down side I found that the projector did not run very long on battery so best to keep it on mains and you need to have a device such as a laptop or freeview/sky HD/DVD unit to feed it a signal as it has no built-in tuner. I found the Acer c20 pico projector to be good, but maybe not for the original purpose intended. It takes very little time to setup, can be quickly focused using a manual focus wheel on the side although I did find that after the projector had been running for a while you had to refocus the image and the full image edge to edge/corner to corner – was not in full focus but to be fair I was probably pushing it at 8ft away and wasn’t too bothered that I was aiming exactly perpendicular to the wall. After a few years using a Topfield TF5810PVRt I have had to move on. I was going to say ‘sadly’ as the Topfield was great. It recorded two freeview channels at the same time, had excellent video quality and, importantly, a series link feature. Series link is brilliant as you can record a series and then sit down when you have time and run through the entire series and fast forward the advert breaks (and any boring bits). Unfortuantely the Topfield let me down when the hard drive failed with over 100 hours of unwatched programming. I replaced the hard drive but 6 months later and it’s gone again. When it failed the first time I started to investigate the alternatives and the Humax caught my eye. Now the Topfield has gone again I decided to retire it and go for the Humax. Quickly unboxed it, glanced at the Quick Start guide, then plugged it in to all the connections that the Topfield had previously used but with one difference, the HUMAX has a network port. Powered up and 10 minutes later it’s automatically found the network (and internet) and tuned in all the Freeview channels. First impressions – remote control & menu system easy to use and the image quality looks as good as the Topfield so far. Easy to add programmes to the recording schedule and also a nice ‘find’ feature to scan for programmes that are on later in the week. As I’d missed a programme at the weekend that was on the BBC I pressed the ‘PC Portal’ button on the remote and then chose the BBC iPlayer icon. A few seconds later and the programme I was after started playing. I had to check twice though as the image quality was better than I’d expected. Now I just have to wait for a few programmes to record and hope the HUMAX plays them back when I need them.